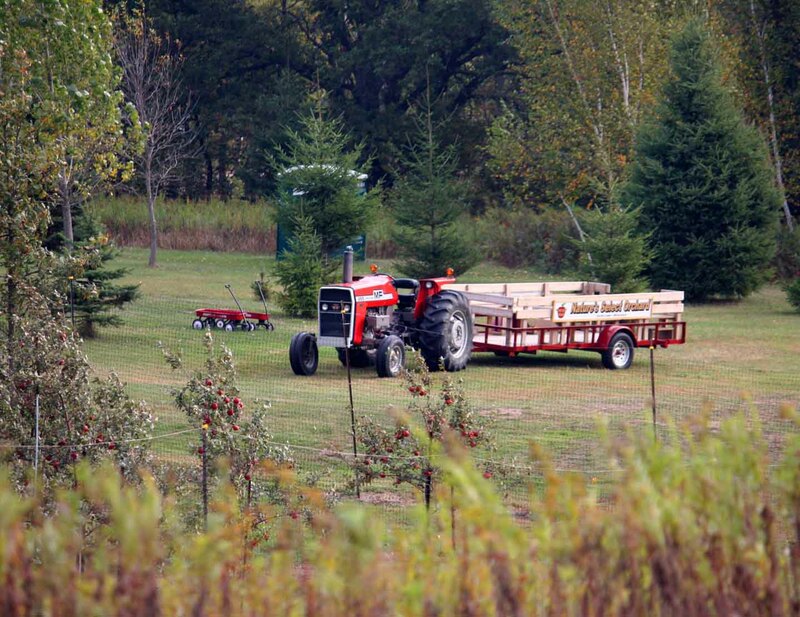 Take a ride on The” Nature’s Select Express” hayride wagon behind a vintage farm tractor. We’ll go out around the orchards and produce fields. We’ll stop at the pumpkin and popcorn areas to provide you with the opportunity to pick out and harvest your own pumpkins and popcorn. Hayrides are available on Saturday and Sunday afternoons between 1:00PM-4:00PM. The Nature’s Select Express is handicap accessible. Wheelchairs will need to be tied into a special stall to prevent rolling around as we do go up and down some rather large hills. 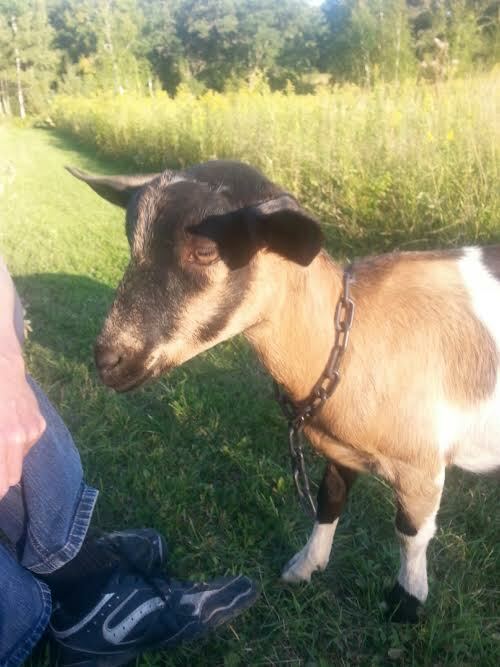 We are happy to offer you and your family a special opportunity to interact with baby goats and chickens that are on site all season long! Our pumpkin patch is the absolute best in the area. We have many different sizes and types of pumpkins to choose from. 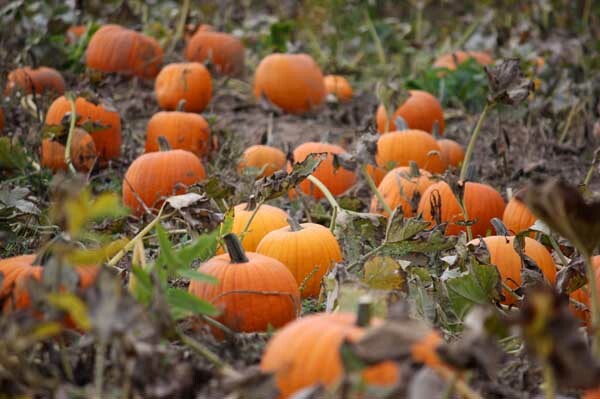 From small pie pumpkins to 75 pound jack-o-lanterns, we’ve got it covered. We also have several types of specialty pumpkins including warted and ghost pumpkins. 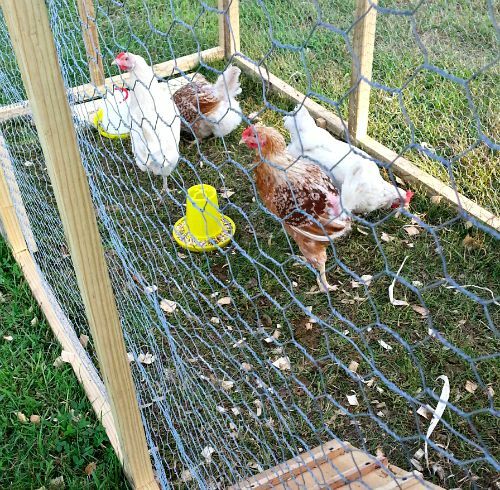 We realize that many of the children today have little hands-on experience with agriculture. It has been our passion to be able to provide a “Hands-On” experience wherever possible. We grow gourmet White Popcorn we know you’ll love. 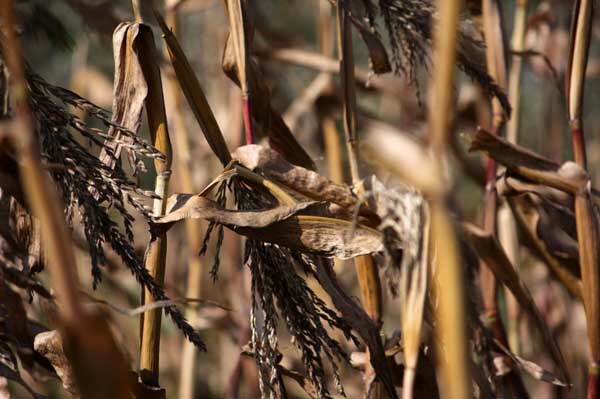 You can pick this popcorn right off the stalk or purchase pre-picked ears and take it home for preparation. Dry it until it’s just the right moisture content and then pop it on the kitchen stove. Then cuddle up for a winter’s evening with the family in front of a good movie. We will provide instructions for the proper drying and preparation of the Gourmet Popcorn with purchase. We have over ¾ miles of mowed trails around the farm to just take a walk and enjoy the autumn colors, fresh air and perhaps some wildlife. Let the children burn off some energy and just enjoy some family time together. 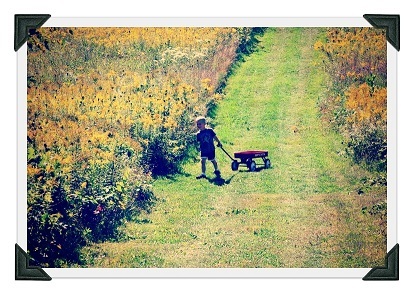 Enjoy a relaxing walk on a mowed 1/4 mile long trail with your family. This trail winds through a grove of 150+ year old Burr Oak Trees. From what we have been able to learn over the past 20 years, some of these trees may be well over 200 years old. White Tailed Deer, Squirrels, Snowshoe and Cottontail Rabbits as well as Wild Turkeys also use these trails. You never know what you’ll see! Don’t forget your camera and bird book. There are actually dozens of different wild birds in the area so get ready to see birds you may not have seen before. We provide several Radio Flyer Wagons for the convenience of your children but recommend you bring along a stroller for those that may get easily tired. We have also placed a “Leopold” Bench on this trail for you to just sit, relax and enjoy. 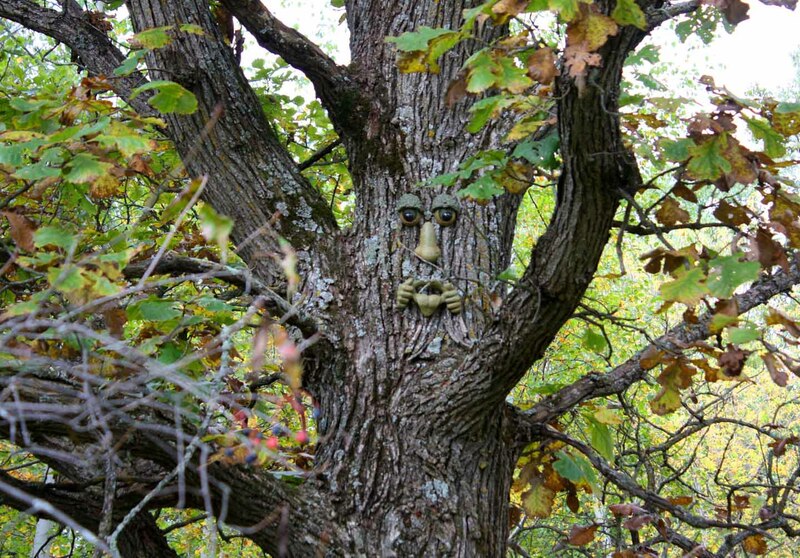 Look for our "Grumpy Old Man" tree and the other characters on the scavenger hunt list! 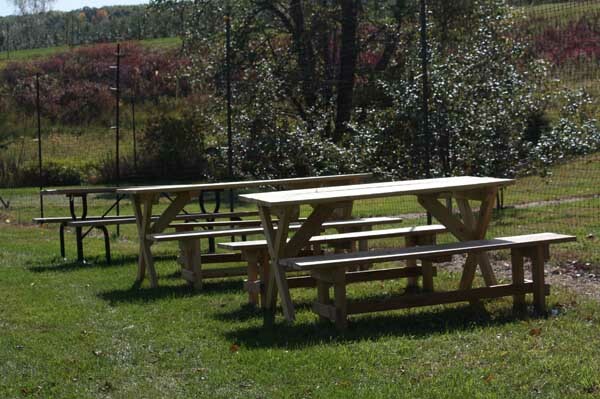 There are picnic tables available for your convenience. Bring along your picnic lunch and enjoy the fresh air and country atmosphere. Don’t forget to bring along your camera! We will have a setting prepared for you to take your children’s picture. In addition, during special event days at the orchard, we will be there to take family pictures using your camera or our camera and provide you with the photographs. Just spending a relaxing afternoon in the country fresh air enjoying the sights, smells, sounds and scenery of the country autumn can build precious memories that will last a lifetime. We will be providing prescheduled, small group and school tours. Tours must be scheduled a minimum of one week prior to tour date. During these tours we will provide demonstrations pertaining to bee keeping, harvesting the honey and when possible, have an observation hive available to view the bee’s activities inside the hive. 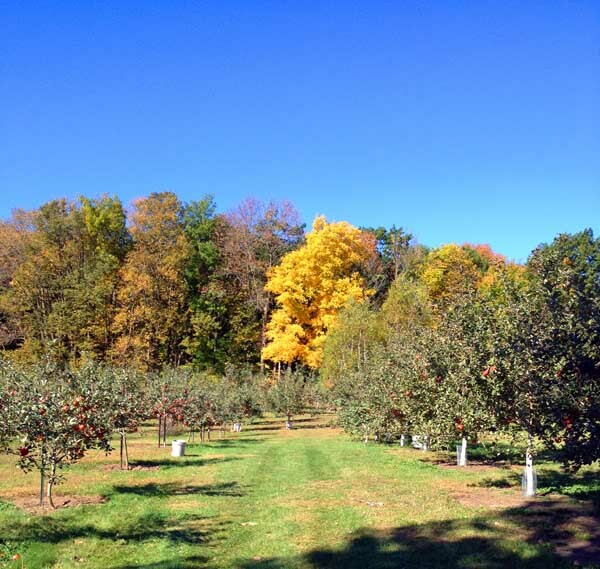 We will also take a hayride out around the orchards and the produce fields. We can also make available to school groups, “Enjoying the Harvest” booklets through the Wisconsin Apple Growers Association to use in your lesson planning.